The picture shows one of the liner o-rings that twisted during assembly in engine. 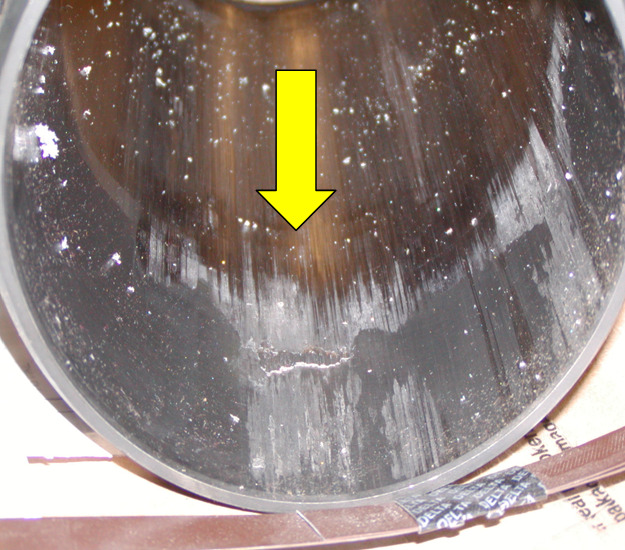 View of inside of above liner shows a buildup of transferred skirt material at bottom of liner caused by the o-ring forcing the liner inward. The first picture is of two liners from a 16V149 Detroit Diesel marine engine. Note the presence of heat spots on the lower area of the liners as pointed out with the yellow arrows. 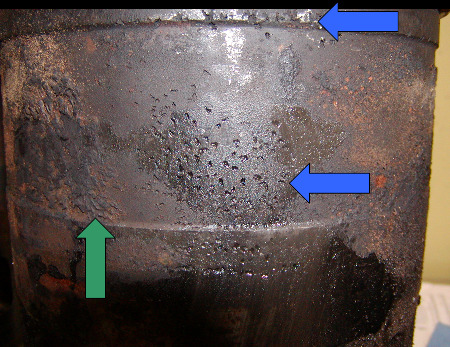 Heat spots occur when there is excessive clearance between the liner and the block. This area will have very poor heat transfer and will allow for liner movement and distortion. This can cause the liner to crack in the port area or other locations on the liner where stress loads exceed design strength. The next picture shows the pitting (blue arrow) and scale build up (green arrow) on one of the liners. Pitting and scale build up is a clear indication the cooling system has not been maintained and no additives or corrosion inhibitors were used. 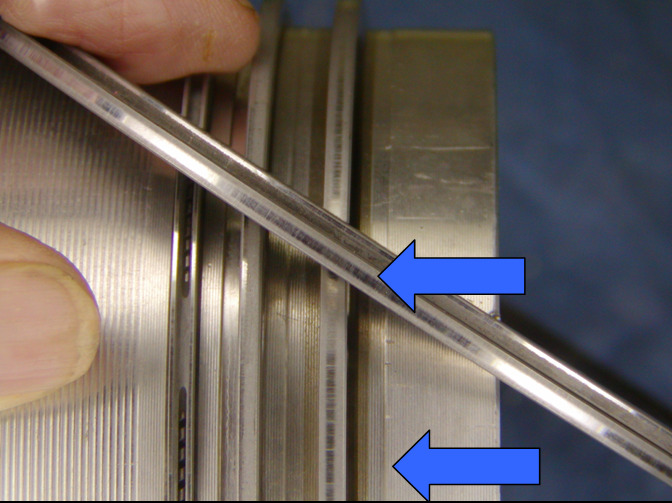 Scale build up will affect heat transfer and cause higher than normal cylinder temperatures potentially leading to scoring and premature failure of cylinder components. 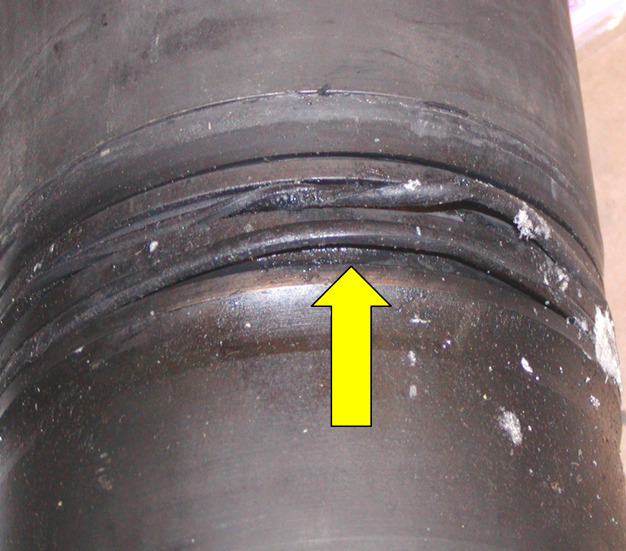 The pitting can and will cause stress risers to develop in the liner potentially leading to cracks and premature liner failure. The next picture shows the underside of the liner flange in front of the fractured area of #5 left bank liner. 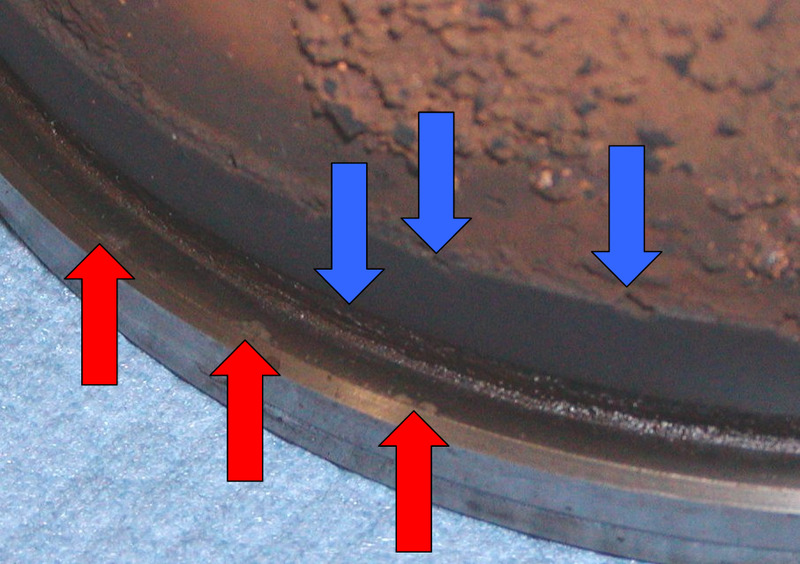 Note the pits (blue arrow) and the four clean marks indicating foreign material was trapped between the flange and the block (red arrows). The next picture shows the score marks inside one of the liners (white arrow). Scratches and some scoring is present in most of the liners. 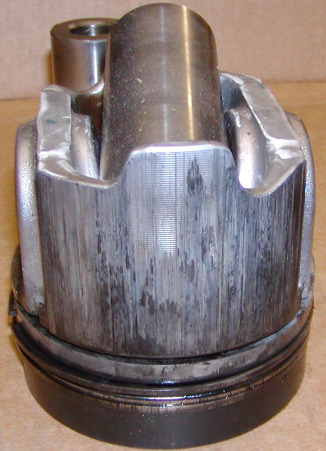 The final picture shows the crown and rings on one of the pistons; all the pistons are similar in appearance. The white deposits are caused by additives in the oil. A perfect seal between the piston rings can never be achieved, thus a certain amount of engine oil will enter the combustion burn. 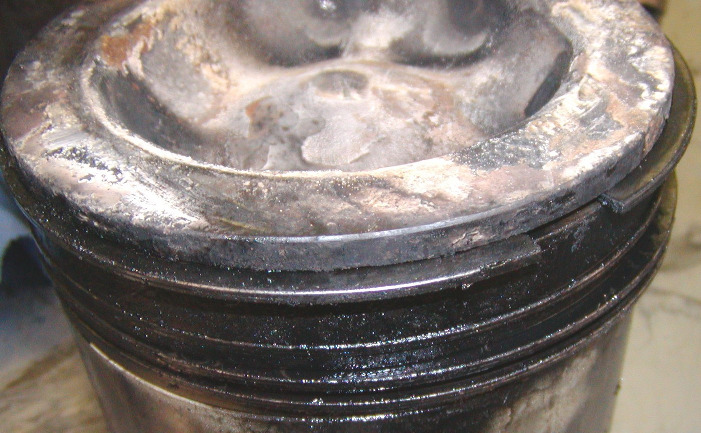 As the engine oil enters the combustion chamber and burns, residue forms an ash-like material. This ash-like material contributes to deposits in the crown land above the piston ring as well as to deposits in the ring grooves. 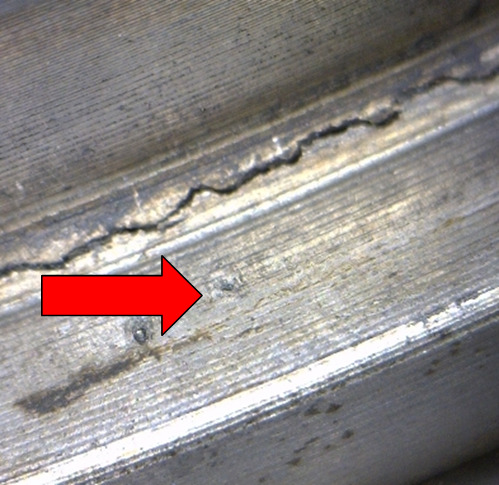 These deposits can lead to rubbing wear on the cylinder liner causing the piston rings to cease operate freely. 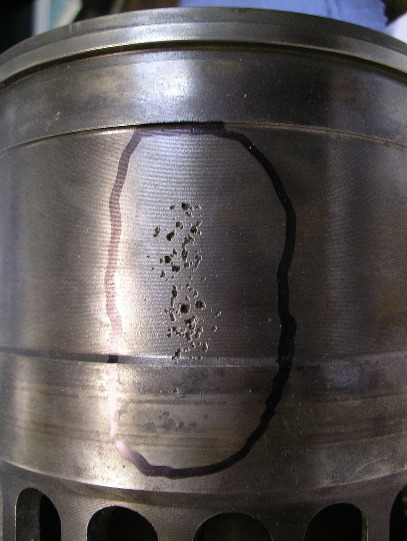 Ultimately, the cylinder liner-to-ring interface is compromised and high oil consumption can occur. 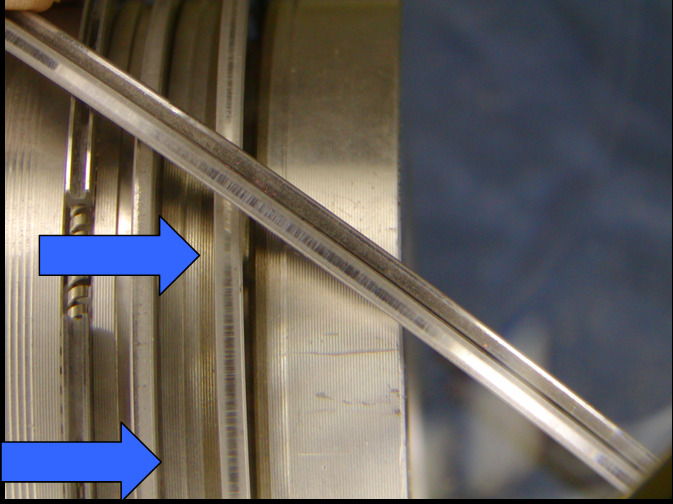 The following pictures show the liner, piston with rings attached, and a set of piston rings that were marked: “original ring set”. After the original rebuild the customer complained of excessive blow-by. He disassembled the engine, honed the liners and installed new rings. Upon start up the engine was found to have excessive blow-by. 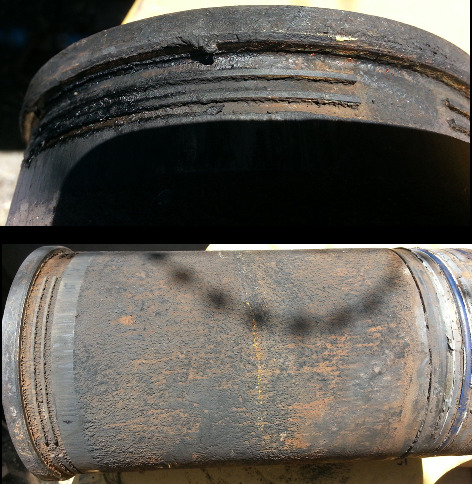 The above picture of the liner shows deep scratches from abrasive foreign material causing a path for blow-by. This is caused by lack of cleanliness during assembly of the engine. The liner also shows where it was honed. The honing angle or cross hatch is not uniform. This will cause uneven wear. More pictures of foreign material scoring. The next group of pictures will show the rings marked “original ring set” set on top of the piston that has the rings installed. Please note the heavy scratch marks on both sets of rings. 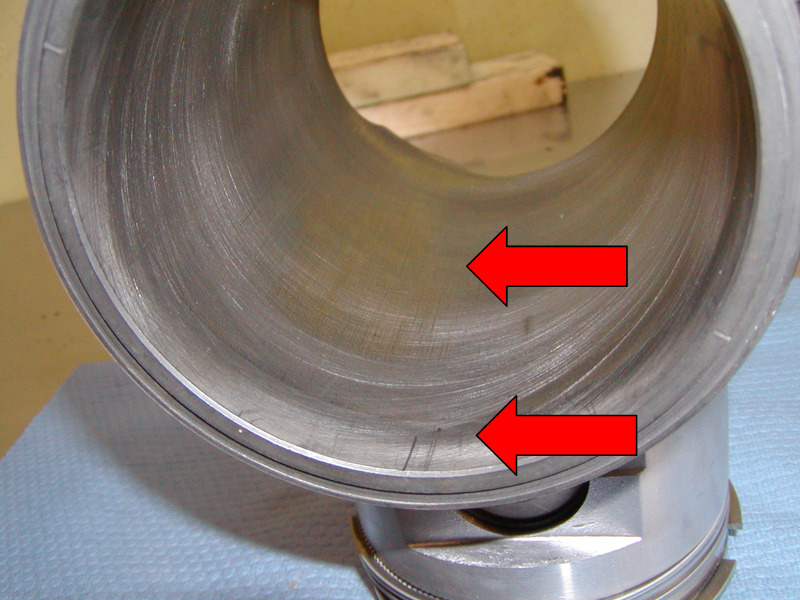 The root cause of failure was caused by foreign material contamination due to poor assembly practices and procedures. 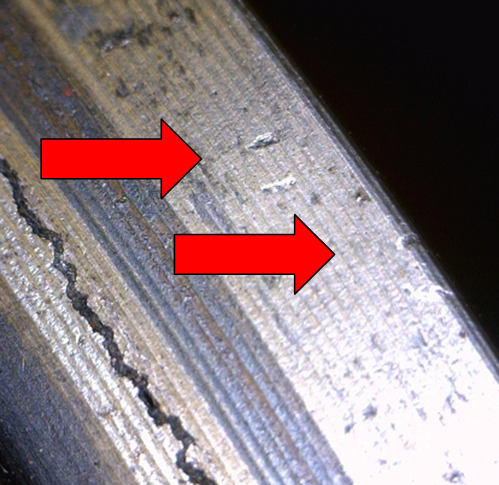 The contamination caused blow-by in the first set of rings was not corrected and caused the same failure condition in the second set of rings. The lower part of the liner has fretting where it interfaces with the lower receiver bore in the block. 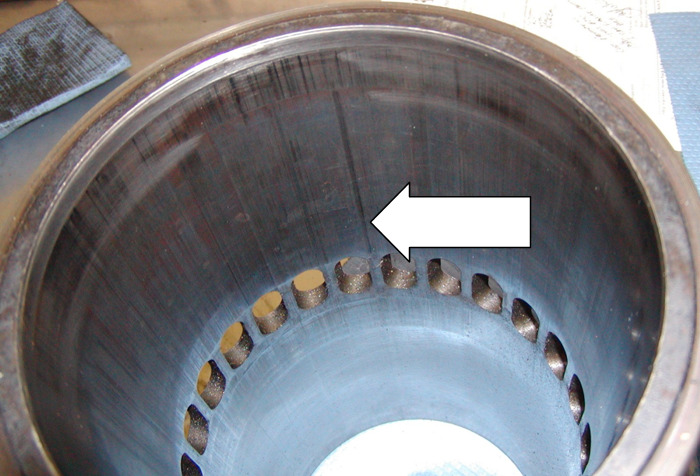 Lack of support allowed the liner to move, eventually causing the liner flange to fracture. 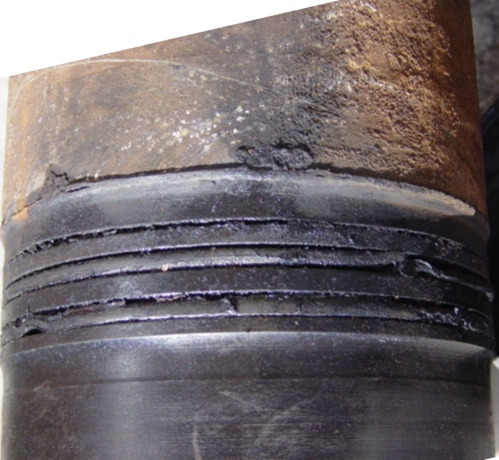 Liner flange failure caused by uneven mounting surface. The flange is intact and has broken free of the liner. The under side of flange displays an uneven contact pattern. 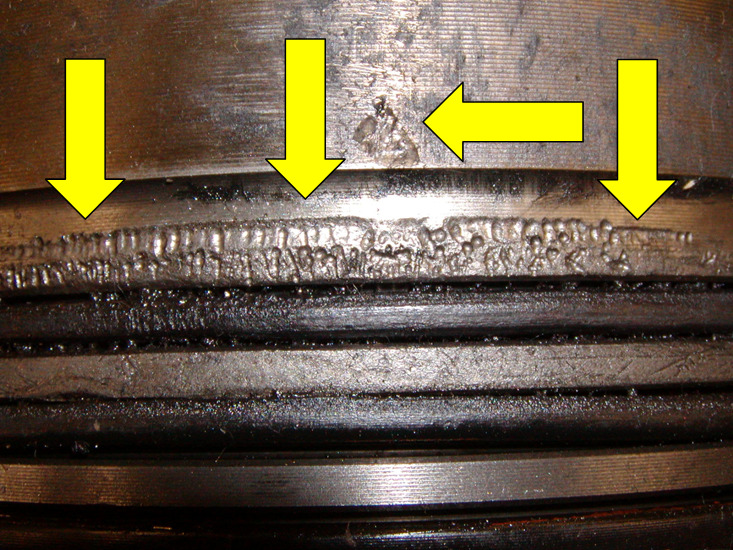 The un-even wear pattern on the under side of the flange indicates mating block surface is worn and caused the failure. The liners in this engine failed within 800 miles. Improper cooling system maintenance is the root cause of failure. Cooling system corrosion inhibitors are needed in all situations even if antifreeze is installed. This liner was subjected to plain water with an extremely high mineral content. 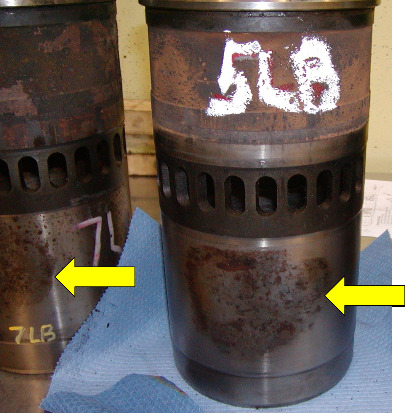 The impressions on the liner flange are from trapped foreign material between the liner flange and the cylinder head. Foreign material trapped between the liner flange and the block surface. The pitting caused coolant to leak into the cylinder. 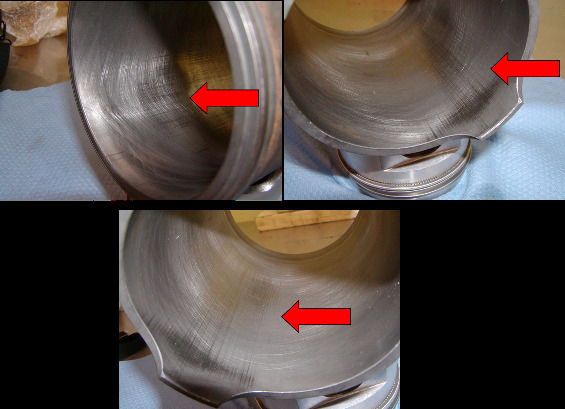 Corrosion shortens engine life and damages cooling system components. The complaint sent in with this liner was leaking liner seals. 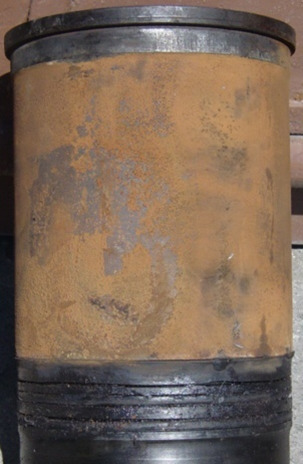 Rust causes poor heat transfer and engine overheat.